“That sounds a little high.” Note: No matter what dollar amount the customer puts on the table, just state those five words and then shut your mouth. Since most people become increasingly uncomfortable with silence, your tight lips will force the customer to say something in response. Either he or she will make a more reasonable request, or they will attempt to justify their request. How much does agent turnover cost a call center? Q. One of our top challenges in my call center is agent turnover. Do you have any statistics on the cost of agent turnover on the call center or the company? Myra’s answer How much does agent turnover cost a call center? The call center industry historically deals with extremely high turnover, with some outbound and telemarketing centers experiencing rates greater than 100% annually. More typically, a service or other inbound center may experience rates ranging from 10% to 50% or more annually. According to a recent poll of 1,000 call center managers, the average turnover is 19 percent. The highest were credit card centers at 46.9 percent. There are more than three million customer service representatives (CSRs) working in North America. This means approximately 600,000 new CSRs must be recruited and trained each year. At an estimated cost of $5,000 each to replace each CSR, agent turnover can soon become a costly business. How can we reduce call center agent turnover? Looking for realistic tips for reducing agent turnover in a large call center. Myra’s answer How can we reduce call center agent turnover? Seven practices have been identified to reduce agent turnover. What factors impact turnover for call center agents? Q. We are experiencing turnover levels of nearly 300% and we’re at our wits end about what to do. We’re attempting to start by identifying what factors lead to turnover with call center agents. Can you advise on factors that lead to turnover in call centers? Myra’s answer to What factors impact turnover for call center agents? I love to answer your questions. 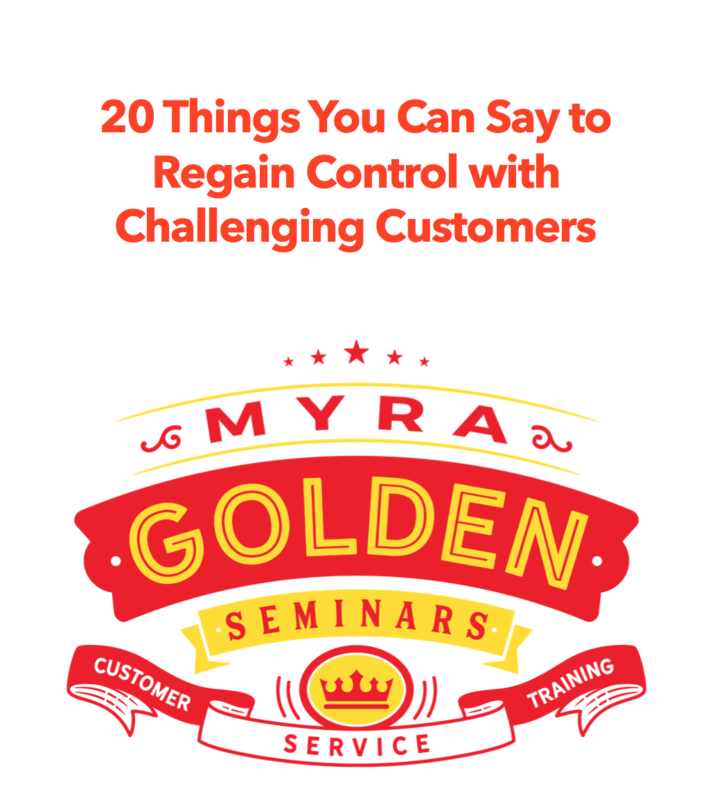 Email your questions to me at info@myragolden.com. Q. My single most frequent and challenging issue with employees is attendance. I think your 7 Steps for Addressing Unacceptable Employee Performance (from your webinar) are brilliant and I’ll certainly use them. But while we’re on the subject of attendance I was wondering if there is anything else you’d care to share. Thank you for that question…I’m sure several customer service and call center supervisors on this site can identify with you. *Express both empathy and firmness during your dialogue with the employee with a statement like: “I can understand your mornings are hectic. But when you took this job you knew the hours were 8:00 am to 5:00 pm.” This type of statement shows that you are “human” and understanding, but also that you are quite serious. *And let me say, finally, that a lot of attendance issues are probably with Generation Xers. Your younger employees were shaped and molded by different times. These times were largely “flexible” in every area from the way they were parented to the attire they were allowed to wear in school. Flexibility is all they know and that’s why you will likely have “issues” with getting Xers to work on time, getting them to come in early for a mandatory staff meeting or getting them to work overtime. They are accustomed to being able to “negotiate everything and saying “no” at will. When they are tardy or absent, they are not usually being defiant, they are simply responding to your rigid rules with an assumed “rightof flexibility” the way they have all of their lives. Am I suggesting that you should put up with the Xers flexibility needs and allow them to come and g o as they please? Absolutely not. You’ve got a business to run and compliance with company policy is a reasonable expectation. Here’s how you address attendance issues with the Generation Xer. Second, explain the impact on noncompliance on co-workers, customers, and any other relevant parties. And lastly, lay out the consequences of failure to comply with the policy. Sadly, establishing clear performance expectations and explaining organizational impact, alone, will not be enough to get your Xers to comply with policy. You’ll have to clearly relay the immediate consequence of incompliance. An easy way to do this is “I need someone who can and will be here by 8:00am every morning. I hope that person is you. If you can’t do that, I will be forced to take progressive action that may include termination.” I know it sounds harsh, but you cannot afford to leave room for misunderstanding.